A visual story activity for people to discover, open-up and find out more about aspects of histories not often told. Revealing the emotion and the impact or difficult lives. Cassie Herschel-Shorland’s entry is visualisation in the fullest sense of the word. It delights not only the eyes, but the senses of touch, sound (as it is opened and explored), curiosity, discovery and community. It is literally many-layered, visualising the process of burying and then re-discovering the past. Its direct, participatory nature imbues the original story with additional layers of meaning as each person engages in exploration individually and with a group. This comic tells a selection of stories concerning one single artefact and the people that find, own and lose it during their lives. It is used, lost, buried, found, buried, found again and buried again countless times whilst it is in circulation over thousands of years. Four thousand years of human stories, or portions of stories, stored within a single object are presented within the frames of this comic. Through the acts of burial, discovery and reburial the object and the narrative gather meaning – eventually reaching beyond the comic frame and into contemporary archaeological practice, quietly commenting on our own place within this object’s biography. Meticulously documented, Nela’s work delivers a dissertation’s worth of theory and research in fifteen engaging frames. This crowd sourcing tool and a website is a joint effort from the St. Kitts Department of Culture and researchers, Habiba and Eloise Stancioff. The pilot version attempts to assimilate, promote, visualize, analyze information and unearth both intangible and tangible heritage from communities of St. Kitts. 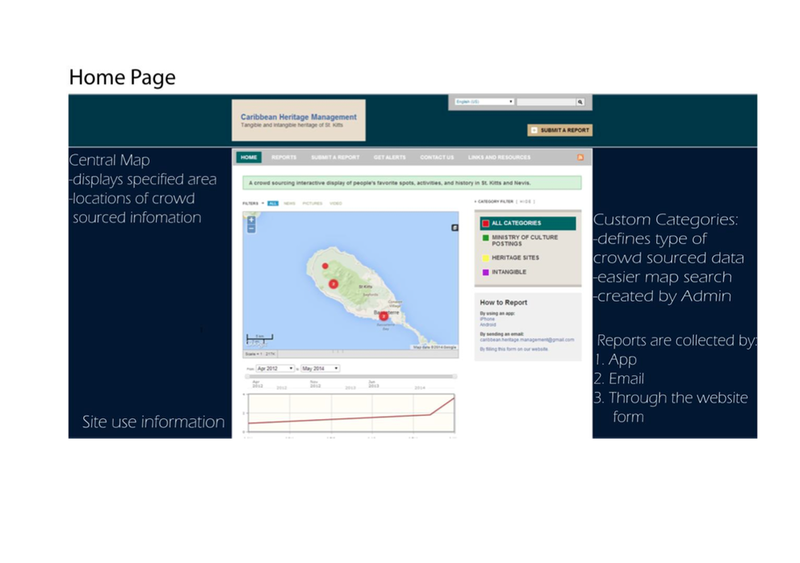 This crowd sourcing tool is a web based platform that provides users an interactive map interface to locate and learn about everything culturally interesting about St. Kitts. Habiba and Eloise’s entry visualises the largely unrecorded heritage of St Kitts through a map-based interface. But it goes far beyond this. By relying on the people of St Kitts for data, the project has given shared ownership and stewardship to those whose heritage is being presented and recorded. The data visualised here are not simply dots on a map or a collection of photographs, but are imbued, from the moment of digital creation, with the personal meanings and stories of those who submitted that data. This is visualisation for good, making a positive impact on the inhabitants of St Kitts and enriching their experience of their historic environment. Screenshots of the site in development. The goal of ieldran: The Early Anglo-Saxon Cemetery Mapping Project is to display all burials in England that date from the mid-5th to early 7th centuries CE with relevant information about each location. While there are numerous studies that have covered this period, there are no open access or shared databases of sites. With this in mind ieldran, meaning ‘ancestors’ in Old English, was created to provide an online geospatial database of all excavated cemeteries from Early Anglo-Saxon England. Ieldran aspires to be a digital ‘sum of all knowledge’ of early Anglo-Saxon cemeteries. While these sites have long been subjects of archaeological investigation, the majority remain inaccessible and isolated, particularly for researches without access to UK-based resources and collections. Meyers and Austin’s work is a gift to the research community, collating all published research on every cemetery site (under creative commons license, no-less). For the first time these important sites can be directly compared, cross-referenced and queried – by anyone. Their work opens up this ‘buried’ subject to unexpected and excited scholarship and creative work. Visit the live ieldran site here. is an interactive experience in procedurally extracting, uncovering, and reversing, the burial of latent semantic core archaeological knowledge. 'Buried' is an ergodic literature game in which you play as an early career archaeologist who is grappling with the complexities of burial in both its academic and personal contexts. Text and its digital modifiers (code, arrangement, movement) form everything within the 218 individual passages which the player must exersise agency to navigate towards one of 50 dynamically generated endings. Buried aims to challenge how we frame and understand burial, visualisation, game and agency. Click here to play 'Buried'. We decided to explore the burial of artefacts, rather than discussing human burials. We’ve chosen to focus on the fascinating hoard of bronze axes from Colleonard Farm, North-eastern Scotland. In fact one of us (Dr. A) has written rather a lot on this particular hoard (see bibliography in Paradata). Our picture reference was derived from the ‘Symbols of Power’ book (Clarke 1985). More Archaeological Oddities on their site. Sophisticated and nuanced research and interpretation are present in the best visualisations. ‘The Colleonard Farm Hoard’ comic communicates these in a single black and white panel. The traditionally dusty subject of prehistoric pottery typology is made interesting and engaging, revealing this particular hoard and the tantalizing hints of its deeply personal story. All this is communicated with wit and charm, like being told an interesting story by a slightly quirky but beloved mentor or family member. A 3D visualisation to appreciate the architectural form of this overlooked gothic-revival monument located in Spring Bank Cemetery, Hull (UK). It is intended to be part of a wider heritage visualisation project to coincide with Hull's City of Culture celebrations, and to increase awareness of Hull's hidden treasures. People’s memories of particular moments linger on through time, captured and buried within the place in which those memories were created. They become layers of the past, each memory inscribed onto its landscape – natural or built, lively or forgotten. As memories and stories of the past layer themselves onto a landscape, its environment begins to encompass a particular meaning that can be felt and experienced by the people who move through its space. I would like to suggest here that these physical encounters with such embodied landscapes are performances that uncover histories and pasts buried over time. As people move within a place embodied by the past, they recover the meanings that layer the landscape through acts of memory-making and recalling, and experiencing and re-experiencing. A walk down Main Street in small-town Canada. The layers of the past, buried beneath the facades and tarmac of the present. A first-person moment in Sara’s own memories. This is a richly personal visualisation, blending archival, present-day and personal resources into a narrative spanning four generations, ‘coded’ into the landscape. Part podcast, part poetry, this reaches into the heart of what it means to live within ‘heritage’ and to lay down another layer for the future. My contribution to the Heritage Jam is this 10-minute video (linear) version of what is essentially a non-linear document. It is a a microhistory about the burials of Building 3 at Çatalhöyük, Turkey, that date to about 9000 years ago and were excavated by the BACH (Berkeley Archaeologists @ Çatalhöyük) team. It is intended to be part of a computer game - Dead Women Do Tell Tales - that is currently in embryonic stage of design and is the brainchild of Ruth Tringham. At every level Ruth and her team’s microhistory of Building 3 at Çatalhöyük openly interweaves creative narrative, excavation data, metadata and paradata, presenting a visualisation and interpretation of the deeply personal story of one woman’s life almost 9000 years ago. But Ruth is clear that she is presenting but one interpretation and that others are possible. She invites us in to envisage the micro-history itself and to contribute to its continuing story. This is the kernel of a game she and her team are developing – one that also provides a beautiful vision of its own evolving paradata. We look forward to seeing this evocative visualisation grow. Being a videogames artist, I have been interested in exploring the use of scan data (lidar and/or photogrammetry) to be used as models in games. I thought it would be interesting to get a fully rounded 3d model of something like a skull which could have been found in the ground. Museum collections, while preserving artefacts, also have the potential to ‘end their stories’ by encasing them in glass, or in collections storage. An object’s ongoing value and continued relevance can be suspended in museum-amber. This is a particular danger for ‘natural history’ collections of the past, now forming an unwieldy part of many museums’ institutional heritage. David demonstrates how such collections can be ‘captured’ (in an act of almost ‘guerilla surveying’) and reinvigorated as assets for use in new, interactive media. The photographic triptych 'Death (and burial) by chocolate' seeks to capture the sense of discovery, fun, creativity, and ultimately, the shared experience of archaeology. Cake! This surely must be the first cake to ever come complete with its own paradata documentation. It makes it even sweeter, and richer. The layers of the cake lend themselves well to visualising processes of deposition, stratigraphy, excavation and recording. This captivates its audience, engaging their senses of sight, smell, and, of course, taste. A superb take on the Jam theme and without doubt the sweetest entry of the event! Can we have another helping, please?